Mexico's next president, Andres Manuel Lopez Obrador, addresses supporters in Mexico City. 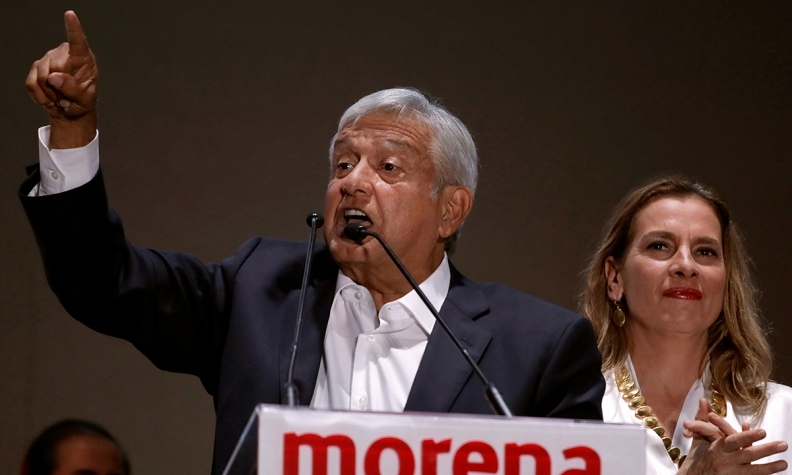 MEXICO CITY -- The victory of Mexican leftist Andres Manuel Lopez Obrador will jump-start talks to renegotiate NAFTA, a top adviser to the presidential winner said Monday, stressing that an agreement is possible before the next government takes power in December. Jesus Seade, Lopez Obrador's chief negotiator for the North American Free Trade Agreement, said in an interview that the talks to revamp the 24-year-old pact had been hindered by uncertainty over the outcome of the Mexican election. After Lopez Obrador's decisive win on Sunday, the negotiations will accelerate, Seade predicted. "We are basically supporting what Mexico has been putting forward," he said. "And we will be more than happy to explore, proactively, ways to energize the negotiation." Seade said he expects to work alongside Ildefonso Guajardo, the outgoing economy minister, as talks conclude. The Mexican team will meet in the coming weeks to determine its game plan, Seade added. Mexico depends heavily on trade with the United States, which receives about 80 per cent of its exports. U.S. President Donald Trump has repeatedly threatened to withdraw from NAFTA, which he says is unfair to U.S. workers. Seade said he supports the positions Mexico has taken in the talks, though he has thoughts on how to sweeten the deal for Trump without unduly harming Mexico. He declined to provide specifics. "My stance is that when I sit down to negotiate with somebody, his views and needs are as important as mine," he said. NAFTA negotiations have stalled over the United States' demands to shake up the auto sector with requirements for more regional content and higher salaries, in addition to a so-called sunset clause that would kill the pact if it is not renegotiated every five years. To appease the United States, Mexico pitched a plan to raise the auto content threshold to 70 per cent, up from 62.5 per cent. Seade stressed regional auto content requirements must remain as low as possible. "I understand Guajardo has offered 70 [per cent]," Seade said. "I find [that] high, but I will not fight it.... But going beyond that, I think it begins to hamper the efficiency of our car industry collectively." He also pushed back against U.S. proposals to raise wages for auto workers, saying that although Lopez Obrador wants to boost wages, NAFTA is not the proper vehicle to achieve that aim. "It begins to create all kinds of precedents for other sectors," he said. "Why not the tourism industry? Why not kitchen equipment?" In addition, the United States has launched a trade investigation into imports of vehicles and auto parts. If the U.S. imposes tariffs on Mexican auto exports, Seade said he would have mixed feelings about retaliation, noting that it can violate trade rules. But he said he would lean toward striking back, noting U.S. corn could be a good product to target. Seade, who has family ties to Mexican billionaire Carlos Slim, is a trade veteran, having served as Mexico's trade ambassador in negotiations to found the World Trade Organization, where he served as deputy director-general. He has worked alongside both Guajardo and U.S. Trade Representative Robert Lighthizer, who he recalled as a "jolly person." "Now that he is a senior negotiator, he has a more austere kind of image," Seade said of Lighthizer. As the WTO came under attack from Trump, Seade stressed the importance of the United States remaining within the group. "I would make every effort to stop the Americans from leaving," he said.